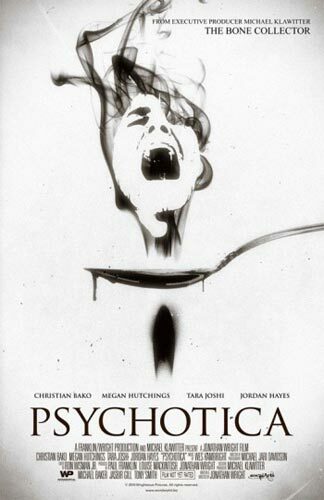 After witnessing one of their friends commit a very gory suicide, a group of heroin addicts decide to get clean. They agree to venture out to a secluded house in the country where they will be unable to access any more drugs, but only after making one last score to enjoy opium bliss for the final time. Their sleazy dealer gives them a freebie -- a little baggie of blue heroin that's just hit the streets. What they don't know is this is no ordinary heroin -- it is a government-engineered super smack intended to end the War on Drugs once and for all by causing users to kill themselves. Problem is, it turns them into homicidal maniacs instead. While the junkies are settling down for their last ride on the horse, a murderous doctor with government ties is looking for the group, and killing anyone who happens to be in his way. It's hard to point to a single element that dooms PSYCHOTICA (aka NOSTRUM). It's a dark and ugly looking movie filled with unsympathetic characters acting out a dumb story. Aside from a visually interesting moment or tow, it's predictable, and worst of all, incredibly dull.